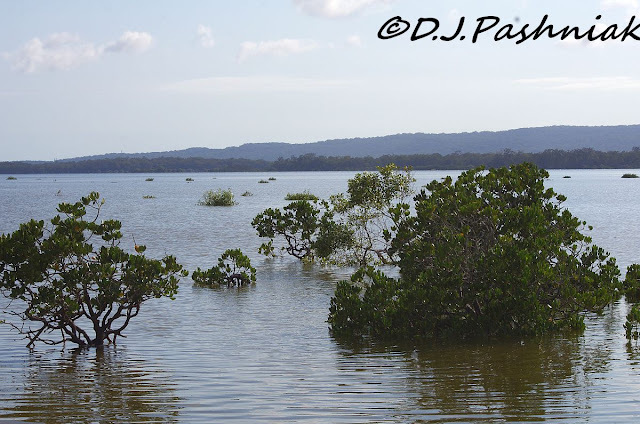 I took a short walk at high tide along the Mullens foreshore the other day. The bay was as beautiful as always. 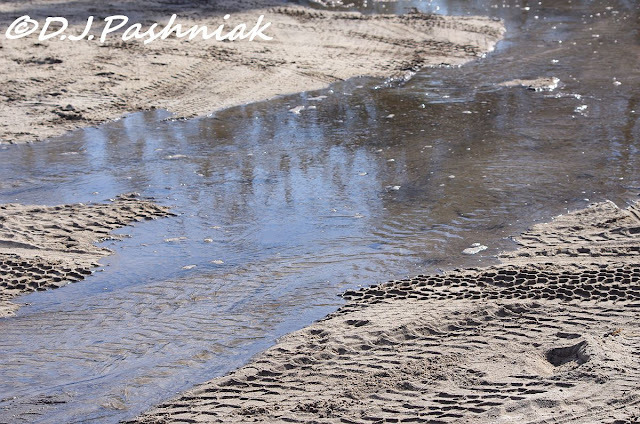 The tide was higher than I expected and around at the boat ramp the water was overflowing the bank and rushing in to the tracks made by vehicles as they maneuvered their boats down the rather basic ramp. 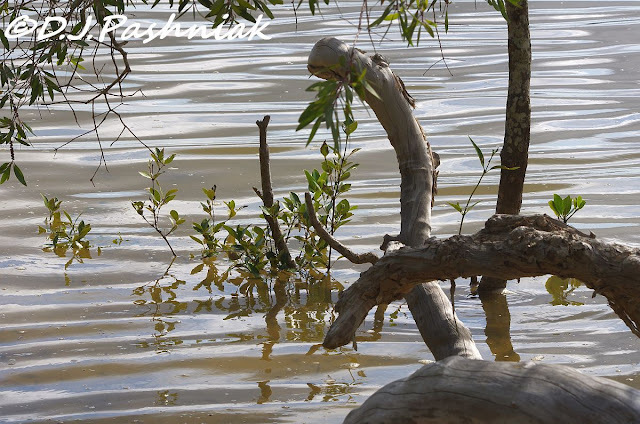 The ripples on the water made patterns of light on the branches of trees overhanging the water. I have not had any time to go out and look for birds this week. We have had some really hot summer weather. It is a bit too hot for comfort I think but all the plants and grass love it! That means extra work with the lawn mower of course. Yesterday I mowed the back yard and when I finished I looked around and there were birds busily chasing after insects that the mower had disturbed. There were two Magpie Larks (Grallina cyanoleuca) with their bills all muddy from probing into the soft soil. Look carefully at the plumage pattern and you can see the male and female. 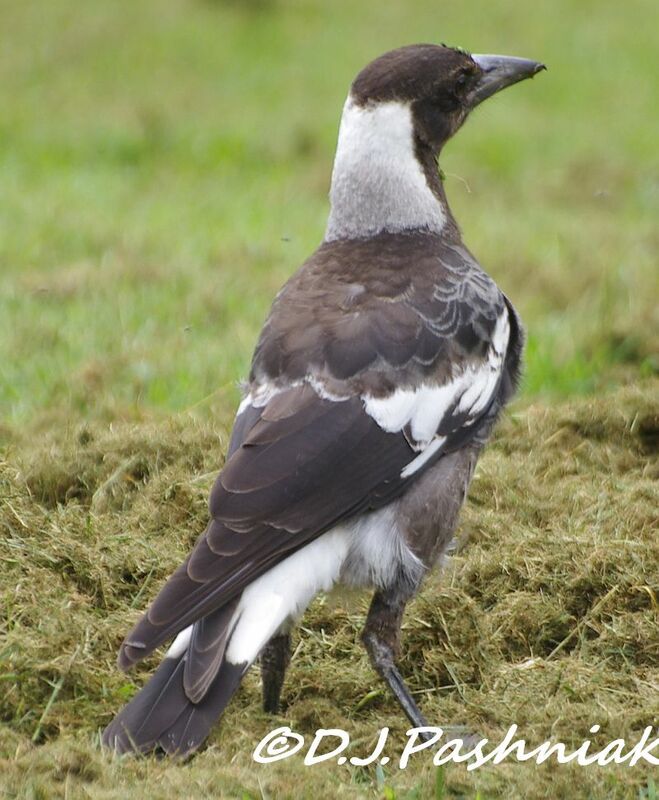 I don't often see Magpies (Gymnorhina tibiccin) on my lawn but I have recently heard some juveniles next door. They too came to take advantage of all the insects I had disturbed. 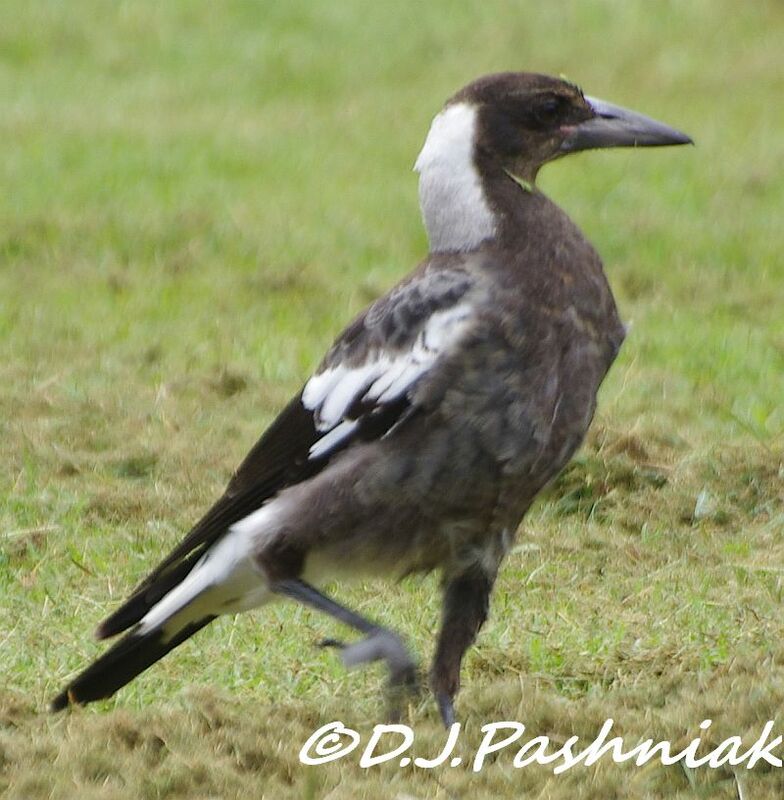 These, of course, are Aussie Magpies which are rather different from those in the northern hemisphere! In adults that grey plumage becomes black. Pretty views of the water. The Magpie Larks are gorgeous birds. Great photos. Have a happy new week! Love birds ~ beautiful and the Trees growing out of the water ~ Great shots! Oh, I do love the birds!! Great captures of a lovely place and wonderful trees!! Thank you, as always, Mick, for sharing the beauty and the fun!! Have a great week!! they sure are handsome birds! We have also had extremely hot and humid weather! It's been hard to motivate myself to get out. 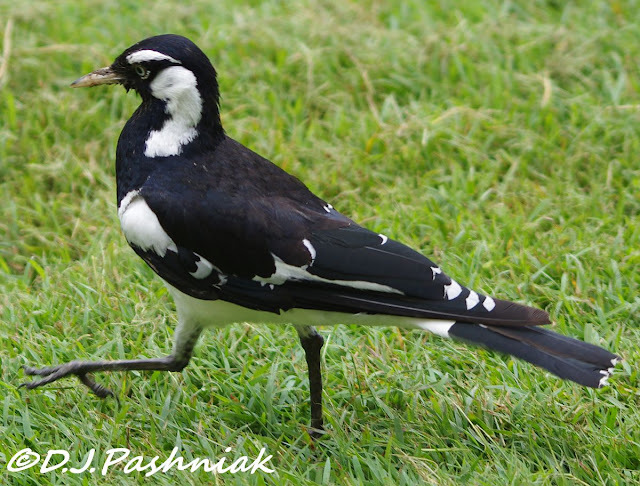 We have a lot of Magpie Larks and Indian Mynas in our yard foraging for insects. Lovely shots of the birds. Hi Mick. I'm struck both by how big that "lark" is and the magpie which looks as big (and aggressive) as our Common Crow. The bills of both seem developed to deal with big prey which I suppose is quite readily available in your climate. I could do with some of that heat right now - fed up of wet and windy weather and longing for at least a frost or two. Like you, I prefer birding to the chore of gardening. Enjoy. What an interesting looking bird. You can't get away from birding ... If you have to stay home and do chores, they come to you! Beautiful birds in their tuxedo colors! 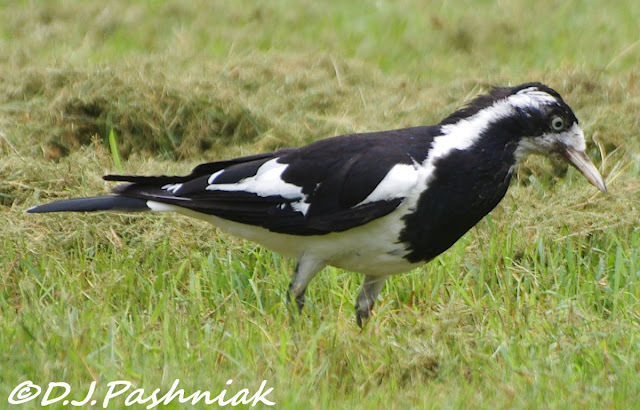 How cool the photos of the Magpie Larks! Great shots of the birds on your mowed lawn. Nice shots of our famous black and white birds. The views of the Tropicbirds on LHI were great - but as I suggested in the post it took me a while to get the photographs sorted out. At one point I had birds flying below me, as I was stood on the edge of cliff. They did not seem too bothered by people either. Nice water walks and good birds...it doesn't get better than that. BUT as for the heat, it's your turn now:) Our desert heat is nasty too.....I know exactly what you're saying.....but I sense that you have a tad bit more humidity than we do. Still there are good birds that show up during this time period. It's just always amazing to me how they can survive such extreme temps. Stay cool! great images of your Aussi magpie. I loved to see it and now you share a young one. Love it! How fun they look, almost like they march along merrily! They are new to me. Great markings. Sounds like you're having a warm summer, Mick! I love the shots of the water as it certainly looks similar to our coastal mangrove areas. Interesting how the birds have adapted to man and know that a lawn mower or tractor means "time to eat"! 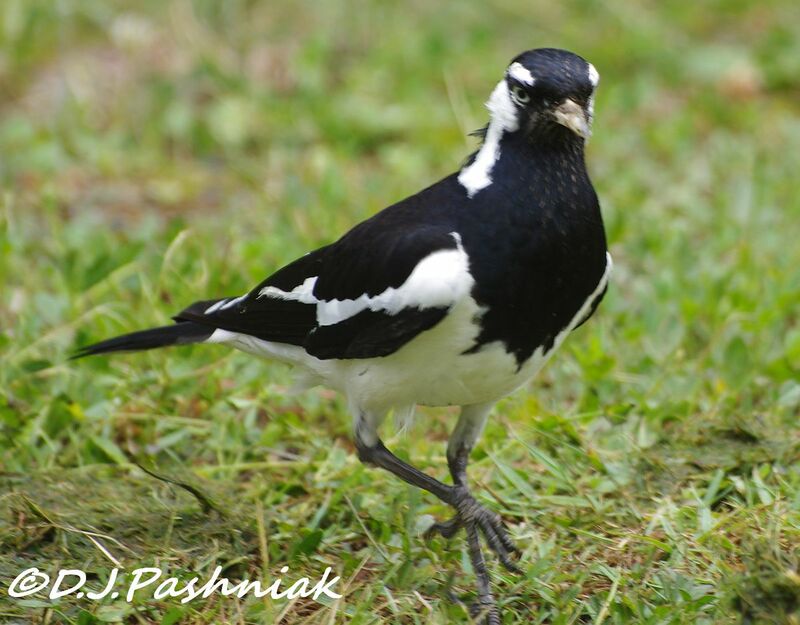 Great images of the Magpie Larks. Beautiful birds! Your magpie reminds me more of our crow than our magpie.